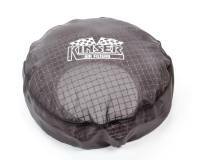 Kinser manufactures specialized racing air boxes and filters. 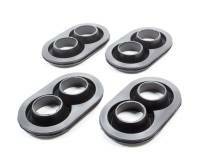 They come in a diverse selection sizes which fit sprint car, midget, stock car, modified and go kart applications. For the past six years Roger Kinser (cousin to Karl, we knew you were wondering about the connection) has been busy designing, producing and selling air cleaners that allow high performance engines to perform at their peak. Today sprint cars, silver crown cars, stock cars, modifieds, midgets, mini-sprints and even go-karts are enjoying the benefits of good clean air thanks to Kinser Air Filters. With a list of satisfied customers that includes the likes of J.J. Yeley, Karl Kinser, Travis Rilat, Kenny Adams and many more, you know that this filter has a leg up on the competition. Uncovering the reasons behind the success of the Kinser Air Filter requires an understanding of the importance of supplying clean air to a racing engine. Probably the best way to illustrate this is to take a look at one of the most impressive engines in existence?the human body. Just like today?s high performance engines the body requires air to function. Depending on the level of activity, the body requires either more or less air. Just think about the difference in your breathing patterns as you perform different tasks?say walking down the hall and sprinting a mile. Now lets complicate matters by requiring that you perform these same tasks while breathing through a straw. While walking down the hall is probably not a big deal, most of us would collapse if we had to sprint a mile while only breathing through a straw. Although probably oversimplified, this example illustrates what happens to your high performance engine when you use a dirty or inadequate air filtering system. When dealing with performance engines, increased air-flow results in both horsepower and increased throttle response. However it is not as easy as just providing the maximum amount of air to the engine. If that air contains dirt, dust or other debris, the life and performance of the engine is adversely affected. For this reason, filters must perform the difficult task of allowing the maximum amount of air through, while blocking the maximum amount of dirt, dust and debris?a delicate balancing act. More Air- Kinser Air Filters deliver improved horsepower and throttle response through increased airflow. The technology and design used to produce the Kinser Air Filters means increased airflow to the engine. Kinser?s use of open cell foam allows much more air through the filtering element than traditional paper/gauze or cartridge type filters. 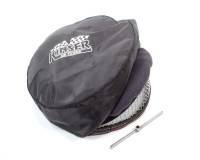 Secondly the domed design of the Kinser Air Filter means air can enter through all surfaces of the filter. Additionally since there are no sharp or hard edges, air sticks to the surface of the Kinser Air Filter rather than deflecting or becoming turbulent. Kinser Air Filters allow air to enter from anywhere on the filter?s surface. There are no sharp edges to deflect or cause turbulent air. Traditional filters only allow air to enter from the sides where it must make a 90° turn to enter the carb. Sharp edges deflect air away from the filter and cause turbulence. Cleaner Air-Kinser Air Filters deliver improved performance and engine life through superior retention of dirt and dust. Kinser Air Filters? use of open cell foam technology allows great airflow without sacrificing dust retention capabilities. Open cell filter foam is a honeycomb of tiny interlocking cells of the same sizes. These cells maximize airflow, while making it tough for dirt to pass, since there are no straight through passageways. 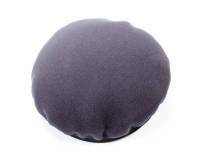 The addition of foam filter oil increases the foams ability to retain dirt and dust particles. As the foam cells block the dust particles, the filter oil traps these particles, much like flypaper. Since these cells run through the depth of the foam, dust and dirt is trapped throughout the filter rather than just on the surface?where it can restrict airflow. Conversely paper and gauze type filters work on a ?Go?No Go? principle. Paper filters are essentially flat surfaces with openings that allow air to pass through. Dirt smaller than these openings passes through, while dirt larger than the openings stick to the surface, clogging the filter and restricting the airflow. The result is continuously decreasing air flow. Less Weight- Kinser Air Filters help competitors shave pounds from the weight of their car through the use of lightweight materials and decreased downforce on the air cleaner system. Kinser Air Filters can even provide a significant reduction in a car?s weight. All of the materials used in the production of Kinser Air Filters are lightweight. One need only pick-up a standard filter system and the Kinser Air Filter system to realize the gain. For further weight savings, Kinser offers optional carbon fiber base plates. Kinser Filter Systems are also able to minimize additional weight that is generated during engine operation. During recent testing, it was discovered that a small block V8 engine at 8,000 RPMs, using a traditional air cleaner system with a paper filter, generates 21lbs of down-force on the lid of the air cleaner . A cartridge type filter at the same RPMs generated 14lbs of downforce. The Kinser Filter under the same conditions only generated a little over 2lbs. Flexibility- Kinser Filters offer the flexibility to easily meet changing conditions using any one or multiple combinations of its filtering elements. Kinser Air Filters offer increased flexibility to meet the demands of changing conditions. Kinser?s filtering element is made up of three individual elements; the primary filter, the qualifying filter and the outerwear. Used in individually or in combination, these elements provide the flexibility to meet changing conditions. For example, many drivers choose to use just the qualifying filter when qualifying. Since there is only one car on the track and peak performance is the goal, the qualifying filter provides adequate protection against dirt and debris while maximizing airflow. Conversely in dusty/dirty conditions or for longer races, most drivers use all three elements to provide strong airflow while providing increased protection against dirt and debris. Easier to Maintain- Kinser Air Filter are easier to maintain resulting in a true cost savings since less time will be spent cleaning and replacing filters. Kinser Air Filters are among the easiest filters to maintain. Washing the Kinser Filter elements in soap in water results in the virtually complete release of dirt and dust particles. After reapplying filter oil to the primary filter element, the system has been restored to like new condition and is ready for use. Traditional paper and gauze type filters are much tougher to clean and can never be restored to maximum efficiency with cleaning. Paper and gauze filters generally never fully release the dirt and dust particles that are embedded in them. Since paper is weak and swells when it comes into contact with moisture, in many cases, cleaning is almost impossible. Even blowing the filter out with compressed air can result in tears or damage to the filter that further reduces its effectiveness.